Since I started my Gamma rebuild (a few years ago now) I have never seen another road fit Gamma 125 in the flesh and I have met only one Guy who claimed he had one at home. 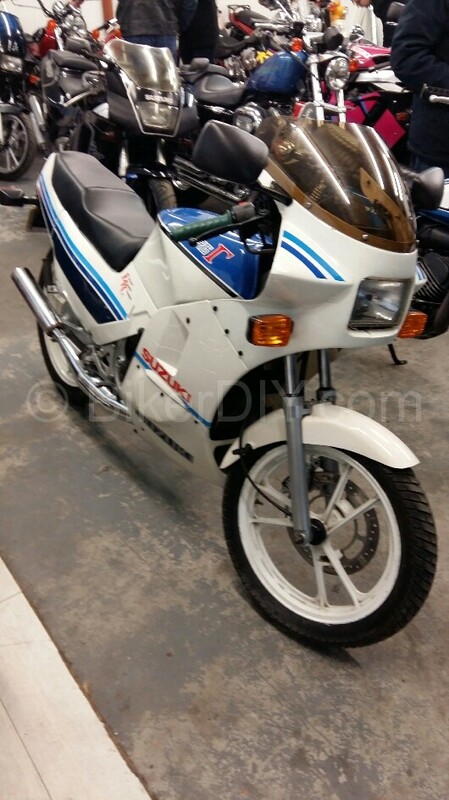 But then as I browsed the Donedeal I see an ad for an RGr 125 for sale, and by a dealer no less. 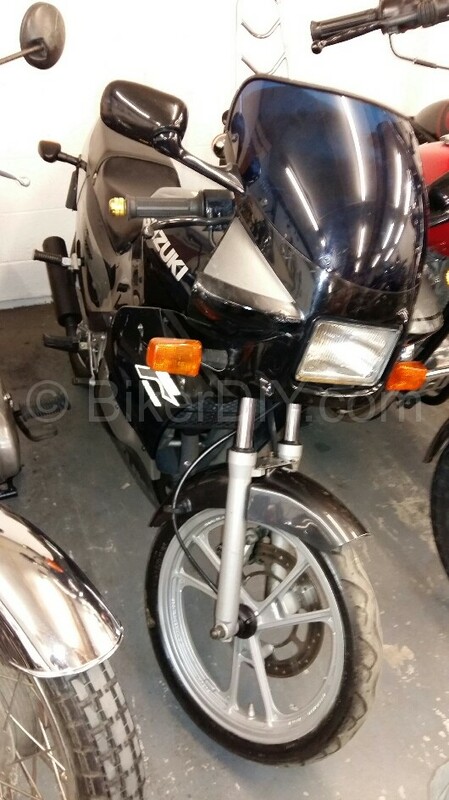 So I decide I must visit this dealer, if only to investigate the different looking exhaust on the advertised bike. Turns out the bike is a mid/late 80’s UK reg rg125 Gamma non PV model 🙁 with a near perfect condition full Micron exhaust fitted to it 🙂 . It was great to see another one of them still alive and well. It started on the 4th kick and to my surprise it didn’t sound a whole lot different at low revs to my own stock exhaust bike, but the shiny Micron pipe to me looks just great on her. And as I enjoyed this example they happen to mention they had another one in the shop as well. Another one! You can actually see it’s front wheel in the background (top left) of the above picture…. This one is an Irish ’93 reg example and it does have a power valve 🙂 . Although I didn’t start this one the dealer claims it’s good and it certainly looks in OK nick. So all of a sudden I have proof that there are at least 3 Gamma 125’s in running order in this part of the world. If you want to know more check out the dealers Donedeal.ie ad or their web site. Hi there, it’s Hans at Practical Sportsbikes here. We’re looking for people who’ve restored RG125 Gammas (1985-91) back to standard condition – have you done this, or do you know anyone who has? If so, let me know! I’m at [admin edit:mail admin@bikerdiy.com for Hans contact details]. Many thanks! Please note all you RG restorers, Hans and Practical Sportsbike mag have completed their article about restored Rg’s which has already featured in the Magazine. However Jim Moore at Practical Sportsbike mag has informed me that they have also done a bigger feature on an RG125 that’s appearing in the Sept issue (2016) of Practical Sportsbike – on sale mid August.